The 2kronor Hostel - Vasastan is in a charming house in the north city centre of Stockholm, in 'a lively area with tons of bars', as described by one Hostelworld guest. Our users often cite their appreciation for the 'safe and comfortable' and 'nice and calm' atmosphere of this hostel, as well as the 'friendly and helpful' staff. Security is tight at this hostel, with both security codes and key cards, while the hostel also features a spacious and well-equipped cellar kitchen. We particularly like the old stone staircase, which adds a nice rustic touch of character. Wonderful, wonderful place to stay, fully worth it. This hostel was perfect for what I needed and amazing value for money. The staff came across quite quiet at first, but I soon realised that they were extremely helpful when I had to make a call to the hostel at 11.30pm and they got back to me straight away. The kitchen was spacious and the showers were clean. I usually stay at party hostels but needed something quieter for this trip, but I thought this hostel was better for meeting people and the people I met were very interesting. This place was so much better than I anticipated. The staff were super flexible and really kind and the facilities were super clean. The place is located only a 15 min walk to the city and is a very authentic experience in Stockholm. Would definitely recommend! Great Hostel. Extremely comfortable beds (stayed in a double single room) Clean, quiet, great location, very nice value for money. Not a party hostel at all. Easy enough hostel stay in an neighborhood not too far from the city center. I was only there one night, but didn't get much of a communal/social atmosphere vibe (but this might not be what they're going for). Easy enough to check in, check out, and use all the facilities. You can't pick your roommates sadly. We stayed twice in this hostel and the first time the dorm door was being chocked open by an American prescription drug addic. It's a fine hostel, clean enough and well located enough. But it just feels like a budget hostel. The staff isn't very nice or helpful. I look to hostels as a place to hang out, meet fellow travellers, etc. And this wasn't that. Not enough bathrooms, they were dirty on sunday. Beds sqeeky, dorm room next to the entrancedoor that slams very loud every time someone comes in. Hostel is probably a good place for people that want a private room but not for alone travelers that stay in dorms and want to meet people. We offer a lot of little extras to our guests and I think that makes all the difference. For instance, we've got free Wi-Fi, free coffee, tea and pasta in the kitchen, plus hair dryers and irons can be borrowed from reception. We also offer bike rental - we've got a number of Swedish army-type bikes for rent - the perfect way to explore Stockholm. 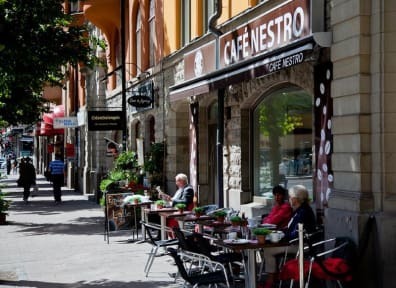 I think our location in Vasastan gives the guests a peek of local Stockholm as many of the city's best restaurants, shops and galleries are in Vasastan, away from the main tourist attractions. The famous city library Stadsbiblioteket is just a block away and Drottninggatan shopping street starts only 10 minutes' walk from here. I usually tell our guests to visit the restaurant Tranan; it's a good place to get a taste of Swedish food, with its genuine character and local clients. Later in the evening the bar on the basement floor is a waterhole for locals and a nice place to have a drink. The many small galleries around Vasastan are also worth visiting.